It’s that time of year again, and Black Friday is almost here! Let’s get our holiday wish lists ready! Here, you will find my favorite infant toys that enhance movement and development. It’s rare that I actually endorse a specific toy. However, over the past 10+ years working as a pediatric physical therapist and using a variety of toys for motivation and movement, I want to share 3 of my favorites that should be on your wish list this year. This play mat is a researched name-brand toy that contributes to significant improvement in initiating movement through kicking. (It's science!) The piano motivates the child to repeat movements through kicking which promotes cognitive and musculoskeletal development. These early kicking strategies have also been linked to independent walking. The piano element can be easily altered allowing the child to be placed in multiple positions promoting growth through movement including supine, prone, sitting and kneeling. This is a great Tummy Time activity mat, too! The toy height allows multiple positions for the child to interact in sitting, prone and kneeling, This is one of the first toys I use to teach a child how to pull to stand from a kneeling position. The multiple textures and sounds enhances the child's desire to interact with the keys and pull the lever arm. It's sturdy base allows fun and forceful play on the keys aiding the child in moving against gravity. 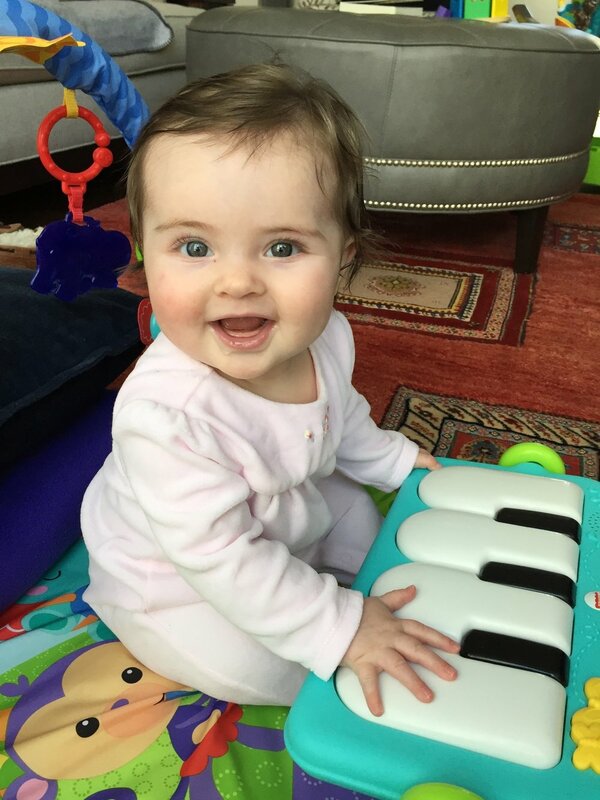 Use this Playskool Rocktivity Piano as the perfect bench to practice transitions from crawling to standing. For more information on using toys to promote movement and development with your child, check out our wellness classes with Boost Babies, LLC which offer one-on-one developmental expertise with a Doctor of Physical Therapy in Austin, Texas.